(2015). Investigation into the Curling Intensity of Polyester/Cotton Single Jersey Weft Knitted fabric Using Finite Element Method. Journal of Textiles and Polymers, 3(2), 86-90.
. "Investigation into the Curling Intensity of Polyester/Cotton Single Jersey Weft Knitted fabric Using Finite Element Method". Journal of Textiles and Polymers, 3, 2, 2015, 86-90. (2015). 'Investigation into the Curling Intensity of Polyester/Cotton Single Jersey Weft Knitted fabric Using Finite Element Method', Journal of Textiles and Polymers, 3(2), pp. 86-90. Investigation into the Curling Intensity of Polyester/Cotton Single Jersey Weft Knitted fabric Using Finite Element Method. 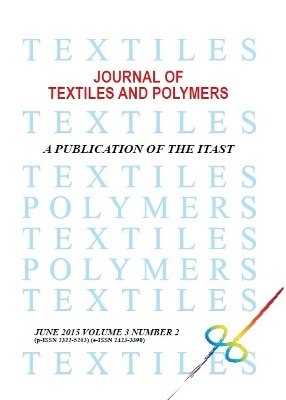 Journal of Textiles and Polymers, 2015; 3(2): 86-90. Curling of knitted fabrics edges is one of the complicated problems of these structures. Therefore, study and measurement of curling in knitted fabrics is important. In this study, it is tried to model the three-dimensional wale wise curl of the fabric using finite element modelling. In this model the tensions in different parts of a knitted loop due to bending and torsional forces in knitting process, is calculated numerically. The result of the FEM model is considered as a measure indicator of the curl loop. By applying the same conditions of loop deformation in all fabric samples, the accumulated force was measured. Developed force is defined as an indicator of the level of curling in the fabric and was compared with experimental results. The comparison between experimental results and the mechanical model is in good correlation.